Our expert physical therapists strive to exceed your expectations by providing the best possible one-on-one care. CoreBalance Therapy is delighted to announce the addition of Tiana Tallant, MA, PT, DPT to our staff! We’ve known Tiana for years, as she was an employee prior to completing her doctorate in physical therapy, and we could not be happier that she has decided to come back and work with us now that she holds her physical therapy license. She brings a wealth of knowledge and skills as well as a delightful and empowering personality to our clinic. Tiana holds a Master’s degree in Health Psychology, which helps her to better understand how people’s behavior interacts with their health conditions. That background fits perfectly into her interest in the management of persistent pain conditions, where treatments such as behavioral modification, meditation and cognitive therapies offer great potential for improved management and function. Tiana also has been a registered yoga therapist (RYT) for years, teaching in the community, and brings that expertise to exercise programming and design of home exercise programs for her patients. Finally, Tiana is an accomplished athlete, competing in CrossFit competitions and distance running events at a statewide level. This is one of the fundamental principles that I operate from in my everyday life and in how I treat patients. My name is Tiana Tallant and I am the newest physical therapist at CoreBalance. I graduated from the NAU DPT program earlier this year and am incredibly grateful for the opportunity to begin my career at CoreBalance. Before entering PT school, I completed my MA in Clinical Health Psychology which allowed me to dedicate time and effort into understanding the human relationship with change- what drives us to change, what barriers we have to overcome, and how we use our environment and/ or relationships to create those changes. In my perspective, coming into the clinic for Physical Therapy is another scenario that asks us to change. It takes us out of our normal routine and for the short term or the long term asks us to do some things differently. Whether you are seeking therapy for an acute or chronic condition, I will ask you for a commitment to try something different- maybe completing exercises at home, being more active, or trying to engage in a certain movement pattern differently. Whatever it is, you will have the opportunity to create meaningful change through your experience with Physical Therapy. I so look forward to being by your side throughout the process!! Tiana is seeing patients at our University location. Her areas of particular clinical interest are musculoskeletal injuries of all types, patients with persistent ongoing pain conditions, and patients who are experiencing difficulty developing an exercise routine for the management of chronic health conditions such as diabetes, high blood pressure, or long-term weight management. You can learn more about Tiana and the rest of our provider team by clicking here, or call us at 928-556-9935 to make an appointment to see any of us. How Does Chronic Pain Change the Sensory System? In my last post I tried to outline the super-complex process that the brain goes through to generate the experience of pain, and what I want to try to do today is talk about what changes when the nervous system is bombarded by pain impulses over a long period of time. This can be a challenging idea to transmit to people who have had pain for may years – they have nearly all heard some refrain on the idea that ‘your pain is in your head,’ with the subtext being ‘your pain is not real’ or, worse yet, ‘you’re faking it.’ I have had patients become angry and leave care, or become tearful or defensive when I try to bring this topic up, which is why I wanted to spend the time writing in my last post about how the experience of pain is generated by the brain. What we are talking about here is not ‘the subconscious’ or anything like that – it’s about structural changes in the parts of the brain responsible for processing various inputs and generating the output or experience of pain. As if this isn’t enough, the brain itself has to get into the act. As with other things I’ve described with this series of posts, the changes are complex, but there are two main themes – loss of precision and a process called facilitation. We’ll start with the loss of precision. As neurons in the sensory cortex of the brain are continuously bombarded with stimulation the stimulation basically starts to bleed over to neighboring neurons, to the point that brain imaging scans show overlap between areas of activation in the brain with stimulation of different parts of the painful region. Patients experience a sense that their pain is spreading over time, sometimes even spreading to the opposite side of the body, and simultaneously becoming more difficult to describe. Rather than pointing at the pain with a finger they wave at a whole area of their body, and they describe a sensation that the pain is ‘moving around.’ This loss of precision is easiest to ‘see’ experimentally in people who have a single extremity involved, say a very painful right arm. We use our sensory cortex to help us identify whether we are looking a picture of a right arm or a left arm, basically sort of superimposing that picture onto our sensory cortex to see which side it ‘fits.’ Those patients with painful right arms, for example, are significantly slower to identify pictures of right arms than left arms, which tells us that their sensory cortex is not processing information quickly or accurately. Facilitation basically means ‘priming’, and to understand this remember that the brain is absorbing information about many different things as it creates the experience of pain, and over time it no longer needs the entire set of stimuli to create the experience. In our course, the analogy was to ask a group of attendees to stand up, then sit, then stand, then sit, etc. Each time the speaker gestured along with giving a verbal command, until the last time when all he did was gesture. And everyone stood. A partial stimulus – had he just walked up to them and gestured initially they would have just stared at him – leading to the output of standing. With pain, it might be the stimulus of an environment or activity that has historically provoked pain. A case study of a bicyclist who had chronic pain with hill climbing was presented – she was placed in a setting where screens to either side of her could be tilted to make it look and feel like she was climbing a hill, and her pain could be brought on (and relieved) simply by tilting those screens, with no change in the actual intensity of her riding. 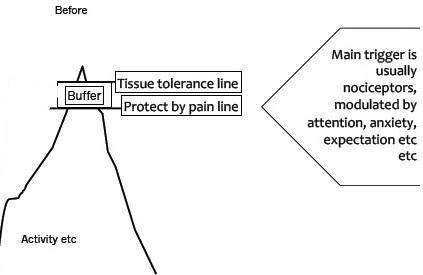 A partial stimulus of hill climbing leading to the experience of pain. (You can read more about her here). So…to recap: Nociception (remember, that’s the name we use for nerves in the body that carry a painful stimulus to the brain) gets amplified by the spinal cord over time. The sensory cortex of the brain that is responsible for generating the sensation of pain and sending it to our consciousness becomes somewhat sloppy (very like what happens with the motor cortex as I described in my first post on this subject). And the pain system begins to leap to conclusions based on incomplete data. Finally, just because I can’t say it enough times, the pain is REAL. It’s just no longer accurately representing tissue damage like it is supposed to. I have one more post in the pipeline, which will deal with what we can do in physical therapy to address this process, but the short version is that it is very much a thing that physical therapy can impact because it’s about retraining the brain, and PTs work with changing brain function every day. Lots of things can change the way the brain functions, including everything from trauma (a head injury or a stroke) to what might amount to an overuse injury to part of the brain (chronic pain), and PTs treat all those things. So if you have a history of longstanding pain that has not always ‘made sense’ to your medical providers, then consider giving us a call at 928-556-9935 or an email at [email protected]. 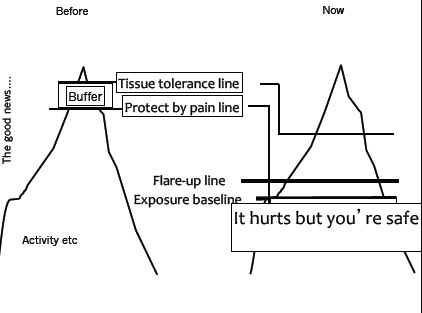 In the first post of this series I focused on how the motor system changes in response to longstanding pain, basically with a shift in strategies towards more of a mass bracing pattern that over time tends to perpetuate the pain. But that’s only half the story, at best – the way we perceive pain also changes in response to a chronic painful stimulus. And, as you can imagine, those changes are not particularly helpful. But, before we launch into a discussion of how the system changes, let’s start with talking about how it normally functions. As with everything else our brains do, it’s an amazingly complicated process, so I’m just going to hit some of the highlights. How Does the Brain Create an Experience? We all like to think that we are directly connected with the reality of the world around us. We use our eyes to see what’s there to see, our ears to hear what there is to hear, and we feel things based also on the stimulation of our nerves. But the process is really not nearly that straightforward. This is an example of an optical illusion, where the viewer is asked to count the number of black dots. Problem is, they keep moving around – white when you look right at them, black when in the periphery of your vision. In reality, they’re all white, but the brain does not accurately present that information to your consciousness because it is affected by the dominance of the black squares. There are also examples of auditory illusions, tactile illusions, even smell illusions! And let’s be careful about this term ‘illusion’ – the perception is quite real – I really do see little black dots in that picture. So, the best way probably to think about how we experience the world around us is to envision a product that has been presented to our consciousness by our brains, after taking multiple inputs into account. So What Goes Into the Experience of Pain? Quite a few things. The first, obvious one is stimulation of a nerve or nerves, at least in most cases. That input to the brain is called nociception. But we know that nociception is neither necessary nor sufficient for the experience of pain. For example, consider a person with phantom limb pain after an amputation. The sensory nerves and the tissues that they are responsible for no longer even exist, but the person nevertheless experiences extremely real pain. We’ve all heard stories about people with terrible injuries who didn’t realize that they even had the injury until later, because they were busy dealing with the situation at hand. Or, on a more daily level, that cut or scratch that didn’t start to hurt until you saw it sometime later. Some of the other inputs the brain takes into account in generating an experience of pain are things like our sense of body position, what we’re seeing and hearing, and what our prior experiences and beliefs surrounding similar circumstances are. The key thing to remember here is that the purpose of pain is to alert us of a threat, and that the brain is attempting to make a threat decision with what it presents to our consciousness. The more threatening the combination of inputs is, the greater the pain is. Lorimer told a great story that summarizes this well. He was walking in ‘the bush’ as they call it in Australia, and felt something catch his foot momentarily. There was no pain, just a catch, and he continued with his walk. Then he woke up in the hospital – he had been bitten by an eastern brown snake, a terribly venomous snake with an extremely painful bite. But his brain had not reported pain to him, because he had such a large experience of walking in the bush and scratching his leg on twigs, so the very similar input of the snakebite was not judged as dangerous. Months later, he was again walking in the bush and felt something catch his leg, but this time it was hideously painful, with persistent pain for a week afterwards. But, you guessed it, scratched by a twig. But that combination of inputs – walking in the bush, stimulus to the outside of the leg, etc – was now on the ‘really dangerous’ list as far as his brain was concerned, in that last time it nearly killed him. This post has been a very long time in the incubator, partly because we’re all so busy and partly because we wanted to be able to give you both some science and some clinical reality. It started last October when Amy and Jay went to a conference in Portland on the topic of chronic pain. It was taught by a pair of amazing researchers, Paul Hodges and Lorimer Moseley. Paul and Lorimer are both physical therapists – ‘physiotherapists’, actually, given that they’re Australians – but they have devoted their professional lives to the study of how pain works and between them have published nearly 300 scholarly articles on the topic. Because they covered so much ground this is going to be the first of a three part blog. I’ll talk about Paul’s work today, and then try to cram Lorimer’s material into a second blog, and finally talk about our experiences in the clinic working to implement their findings into actually treating patients. How Does Chronic Pain Affect How We Move? This is really what Paul Hodges’ work is about. He is best known in the world of physical therapy as the researcher who told us all that the transversus abdominus is important in stabilizing the spine, but that’s really not at all fair to the body of his work. What he has focused on is how the body solves the problem of keeping a stack of bones like the spine stiff enough that it doesn’t collapse, yet mobile enough to move. And, what he’s found is that people do it in lots of different ways (of course). There are, however, some patterns once you step back from the detailed specifics, and, more importantly, people who have a history of back pain tend to use a different set of strategies than people who don’t have back pain. Most of the research here is focused on back pain, but it’s quite likely that similar patterns are at work with other locations of chronic pain, like the neck. Generally speaking, the muscles of the trunk can be divided into muscles that are closer to the spine and those that are further away, with of course some muscles situated in a bit of a gray zone in between. And Paul’s work suggests that the ‘normal’ way that we move is that the muscles that are closer to the spine activate to create just the right amount of stiffness to support the loads we put on our spines, while those further from the spine are primarily concerned with generating movement of the spine. 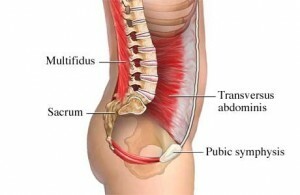 The best known of those deep, stabilizing muscles are the multifidus and the transversus abdominus, and the ones we tend to forget about are those that make up the pelvic floor. These muscles are relatively small, located right in there close to the spine, and are designed to stay ‘on’ for long periods of time at a relatively low intensity. They are also supposed to ‘pre-activate’, meaning that before you go to pick up that pencil on the floor the brain tightens them to stabilize the back. We get stuck in a pattern. When a person first injures his or her back, the body’s reaction is to brace it – to tighten the bigger muscles that are further out from the spine and have longer lever arms to pull on it. 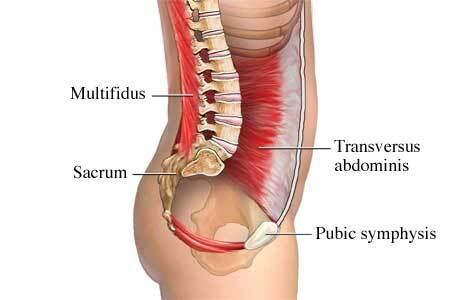 Those muscles normally exist to generate movement, but get pressed into service to hold the injured spine in place. That pattern is supposed to quiet after a while, but if it doesn’t it can become the “new normal,” the primary strategy for keeping the spine stable. And that’s really a problem, because those muscles are NOT designed to be on for long periods of time, and so they complain about it, and get trigger points, and make the spine feel stiff all the time. And they use too much force, so the underlying joints have too much pressure on them. And they just aren’t very good at this new job, so people hurt their back picking up that innocent pencil because the nervous system didn’t stabilize the spine quite right (but they DON’T hurt their back lifting heavy things, because they consciously brace. Sound familiar?). 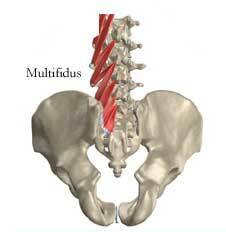 And so, the classic pattern goes, people have further episodes of back pain and each one intensifies this pattern. Hey! That’s me! What can I do?? And…there we have the problem. Obviously, what we’d LIKE to do is turn off those overactive superficial muscles and re-activate the deep ones. But, it isn’t quite so simple. These changes in muscle activation are accompanied by changes in brain structure. Put more simply, most people have had a LOT of practice at this pattern. We’ll talk about this more in my third post, but a couple of key points is that pain of this type is not just a ‘strengthening’ issue – it’s much more about coordination. And you have to work at it from a lot of angles, trying to both activate the deep ones (intentional exercise, practice, feedback) and quiet the overactive ones (stretching, motion, relaxation, massage and manual therapy). Most importantly, treatment needs to be individualized and very attentive to details, which is how we do things at CoreBalance Therapy. If you want to learn more, give us a call at 928-556-9935 or email us at [email protected]. Do you leak when you lift?